The second mind-blowing album of electrifying , mostly original blues rock inspired by the halcyon days of the British Blues Boom of the 60s. Created as a way to preserve and respect the great music of the British Blues Boom era of the Sixties, Mark Doyle & The Maniacs is the brainchild of guitarist/producer Mark Doyle. Signed to RCA in the early ‘70s with his first band, Jukin’ Bone (who played their own brand of fiery, Anglophilic blues rock), Mark has gone on to record and tour with artists as varied as Meat Loaf, Bryan Adams, Judy Collins, Leo Sayer, and Hall & Oates. A visit to the Discography page at http://markdoyle.com details the 65 albums that Mark has been involved in. 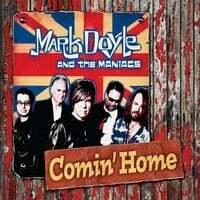 So here are Mark Doyle & The Maniacs, who on their second release are “Comin’ Home” to the British Blues, with a whole new twist. Not to be content with a tribute album Mark Doyle and the Maniacs have recorded a new album of originals ( with a few covers ) that stand right along with the late sixties British Blues era and capturing their live sound.These originals could have easly been recorded then but the Maniacs have put their own syle to them. Live Snakes has a Bo-Diddly type beat behind some tasteful guitar playing and a very rare vocal by Mark and kind of a nice surprise fun track. Mark's Boogie is his tip of the hat to Jeff Beck. Under My Breath is a stand out track with the fade out featuring some of the most emotional guitar playing ever by Mark. His name may be up front but this is a entire BAND effort. Terry Quill's melodic playing is a nice compliment to Mark. There isn't a better rhytmn pair than Frank DeFonda and Mike Ryan who both are what really drives the band. There is not a better singer than Jack "Penetrator" Lipton who snarly garage vocals fit in perfectly. He should be "Maniac" Lipton and walk down the other side of the street if you see him. Check out the great vocals of Jack and Mike on Soledad. And much to Mark's credit , like the pevious album he doesn'tre-invent the British covers but stays very faithful to the originals while adding his own style of the music he loves and the Mamniac sound. If you enjoyed Shake Em On Down you will like this even better with every ones talent shing on the original tracks.